I found it hard to find time to write blog posts at the end of term, what with reports and all those last minute concerns brought up. Christmas isn’t a great time for some children or families and can bring stress and therefore disclosures. There were also Topics that were bothering me which I struggled to write about without disclosing confidential material, which brought me back to why I started this blog. Being a Designated Safeguarding Lead can be an isolating role and you can worry about how you dealt with issues. I thought this blog would be a good forum to discuss some of those issues. However I wasn’t convinced that I was hitting the nail on the head so to speak with the right topics. I tried to discuss issues that DSL have to deal with but sometimes it felt like I was only complaining about something or ranting and I wasn’t getting much feedback from other DSL in schools which was the main reason I started the blog. However other professionals within the safeguarding profession has been the surprising benefit and I feel I have some great connections that I can gain excellent advice and experience from. Self doubt started creeping in during December. What do others think? My employer, future employer or even worse my colleges? I would read all these great posts and think, wish I had written that. All of these negative thoughts would swim through my head and my blog posts would sit in the draft box. #ff and top ten lists would be another reminder of all the great people on Twitter who have done so much and bravely speak out and instead of inspiring would make me question my valiadation. I want to roll my eyes at myself. Being confident is vital part of being a member of SLT, no one wants a line manger who has doubt in themselves. Which makes this blog post seem career suicide. But then everyone must question what they do at some point, surely? To me this shows empathy something I respect in other leaders, so why am I so concerned? Instead of worrying I suppose the questions is how can these blog posts help me be the type of leader that I want to be. And to be proud of who I am, warts and all. In general blogging has helped with some of these points, more so than any CPD. I have connected with some great people, who have helped out tremendously and I have gained experience, hosting #SLTchat and contributing to courses and VLOG. And I have only been writing for half a year so imagine what I could achieve in a whole year. 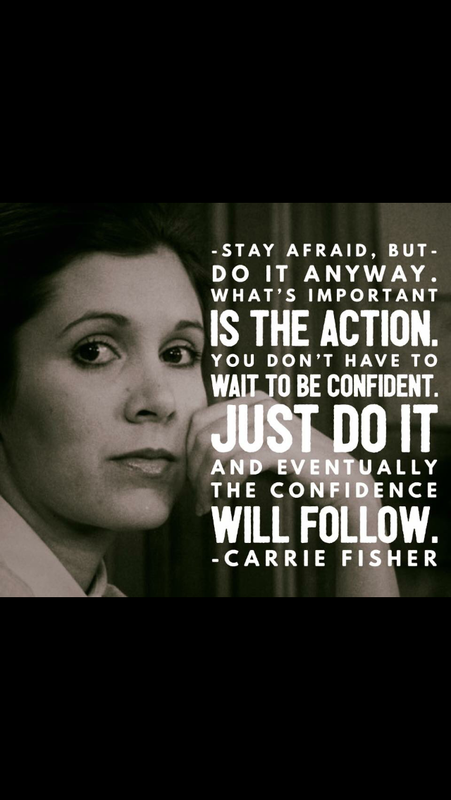 I saw a great quote from Carrier Fisher on Twitter ” stay afraid but do it anyway, what’s important is the action. You don’t have to wait to be confident. Just do it and eventually the confidence will follow.” I think I will print this off and put on my desk to inspire.